A few weeks ago, I met a new chess fan. His name is Abdulwahab Al Atiqi and he told me about a cafe owner who loved the game and how he sponsored chess tournaments every now and then. Luckily for me, there was only one seat left open in the tournament and I asked Al Atiqi to sign me in. The players I met are friendly and they are a joy to be with. As I played in the tournament, I am happy to say I made new friends. 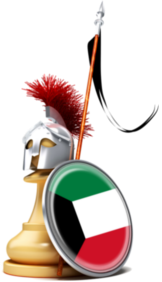 Approximately 15 – 20 players signed up for the tournament. Non of whom I have ever met or heard of. 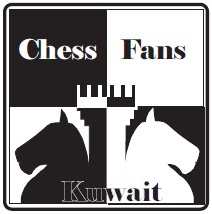 That goes to show you that the chess community in Kuwait is getting bigger every day. I told them about the official tournaments, rules, and even timed games. A few were surprised and also interested about this mind-sport. Maybe we will see them entering this”professional” sport in near future. Anyways, Khaled “Hangout,” the owner of the Hangout-Cafe organized this tournament. It’s a knockout tournament with no time limit per game. I personally played a total of 6 players, including the final round. In the picture below, you will see pictures taken moments before the commencement of the semi-finals. The top 4 players including the cafe owner and myself, battled it out to be the victor. 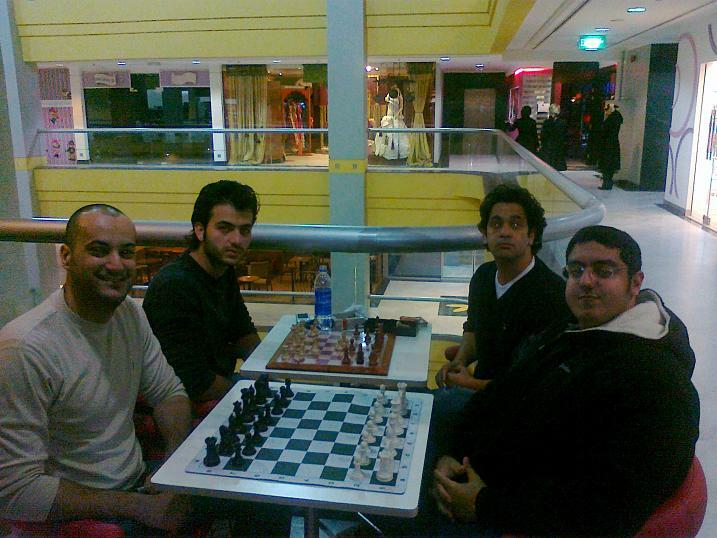 The players are, Khaled Hangout, Mr. Ammar, Hamed Al Mulla, and myself, Khaled Hashem. The pictures were taken on Monday, the 8th of February, 2010 by Bader Al Khaldi. Please excuse us for the low quality of the photos because we used a camera phone. I played against Khaled “Hangout” and Ammar played against Hamed. Khaled Hangout blundred his queen just 15 moves after the game started against me. He resigned and I waited to see who I would play against in the finals. Ammar also blundred his bishop in the opening. 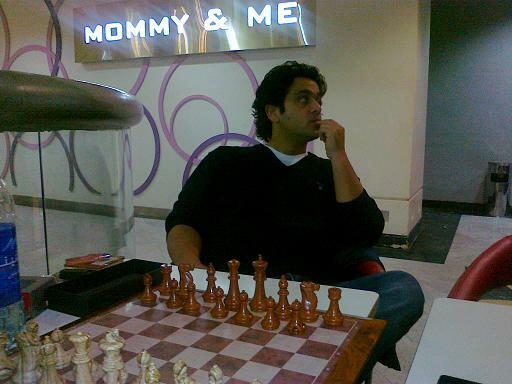 As Hamed slowly creeped into Ammar’s position, Ammar blundred again and found himself checkmated just a few moves later. The final round took place on Wednesday, February 10th, 2010 in the Hangout Cafe. 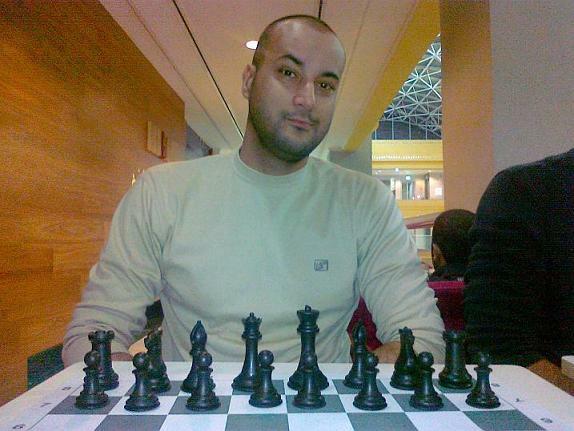 I played the white pieces and Hamed Al Mulla with the black. Against hamed, I chose to play the Queen’s Gambit declined variation. I was wrong to do so because I lost a pawn a few moves from the starting position. I struggled to equalize. 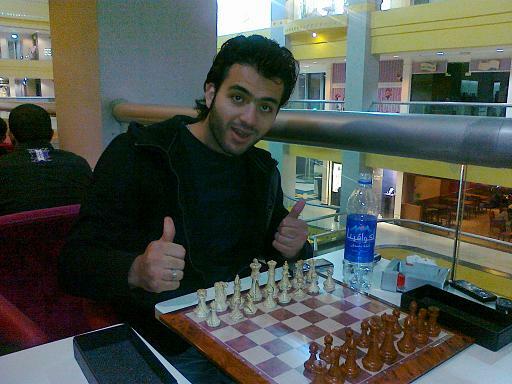 As the game ran on, Hamed was forced to sacrifice a pawn and then another to keep his position in tact. The game went into an opposite colored bishop endgame with me having an extra pawn. The game looked like it would end in a draw. My extra pawn proved otherwise. As I pushed the pawn forward, Hamed Sac’ed the bishop for two pawns leaving me with a winning game. He resigned not too soon after. Khaled “Hangout” congratulated me and handed me a 5 KD voucher to his cafe. Not to shabby for a tournament with no registeration fee. Here’s me saying hello to all the new players I met and I hope to see you guys soon. Cheers! Background Information About Hangout Cafe: The Hangout Cafe is owned by a Mr. Khalid, a Labanese national. 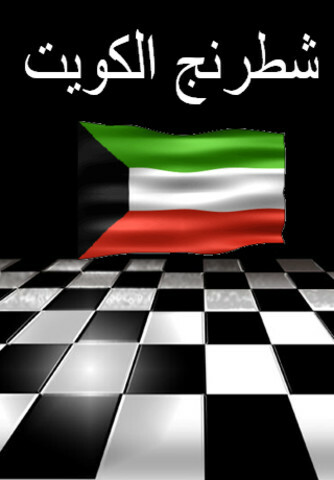 It was created a few years ago and its located in the heart of Salmiya. Specifically, it’s located on the 1st floor in the Galleria 2000 Shooping Mall next to the Plaza and the American University of Kuwait. If you like a free environment where you can play chess openly without stress, this is the cafe for you. Khalid has three chess sets ready for anybody to have a game at anytime. Thank you Hamdy for your lovely words. I didn’t tell anybody because i only found out on the day it began! Atiqi called me at 12 and told me I have a game at 6pm. Basically, I didn’t have time to tell anyone. Hey Asfand! They play well. Most of them are beginners. A few of them were very good.